Many mornings we start the day with juice from fresh produce. I can’t think of a quicker or better way to pack the nutritional punch that a glass of fresh vegetable juice offers. I can definitely tell the difference when we drink our juice versus when we don’t. I also noticed how filling a glass of juice is. 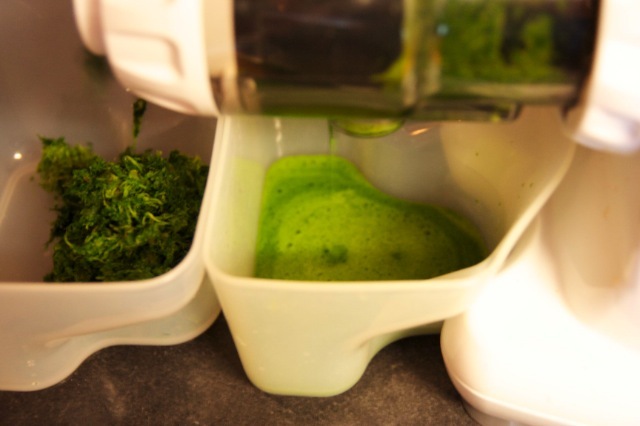 I’m almost always hungry after breakfast in the morning, but when we started with the juicer my hunger greatly diminished and I feel feel almost all the way to lunch. Optimally the produce would all come from the garden (and a lot of it does) but hey, it is my first year gardening! Right now we juice a lot of kale since we seem to have it in abundance in the garden. We have also juiced all the beets that we harvested, though I’m hoping to make some beet kvass with the next ones. I definitely try to buy as much of our produce organically as I can, and I wash the veggies well (have to get any sneaky cabbage worms off the kale!) before I juice them. I don’t typically peel the veggies, aside from the beets, and I include the greens from most things, especially the beet greens. pretty much any fruit or vegetable! We use an Omega 8004 (same as the Omega 8006, but it’s white) to make our juice. It’s a masticating style juicer with low speed, so it doesn’t heat up the juice, which is important since heat can reduce the nutrients. 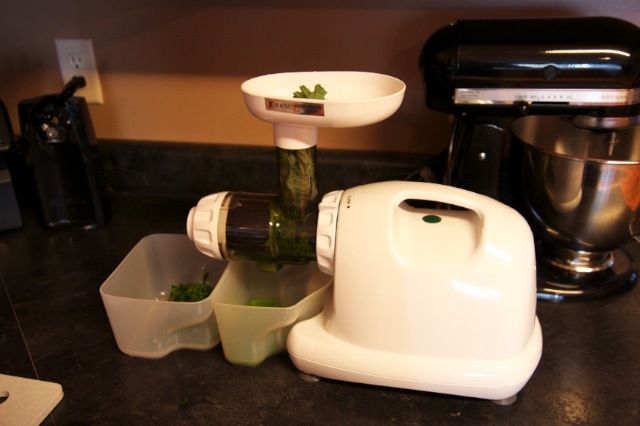 The Omega 8004/8006 is also great because it can handle leafy greens and wheatgrass, which a lot of other juicers can’t. I have juiced wheatgrass in it with no trouble at all, and we do leafy greens almost every time we fire it up. According to the reviews I read before we bought it, juicing carrots is not the strongest point of this juicer. I will say that it has never given me any trouble with them though, and we use them almost everyday as well. Along with juice, the Omega has a few more features. If you put in the homogenizing plate (doesn’t have the screen for the juice to flow out) you can make sorbets with frozen fruit, fresh baby food, applesauce, coconut shreds, and nut butters. I have done nut butters and I think it does a good job but it doesn’t get them quite as creamy as the food processor does. The sorbet desserts are delicious, and fresh coconut shreds were great in granola. It also comes with little caps that allow you to extrude pasta, although my first attempt with them was a bit less than successful. More on that later. I’ll finish up this novel by saying that I have been pleased with the easy cleanup. The pieces all pull apart and a warm rinse and quick scrub with the included brush has always been enough to get it clean. Previous Post We have green beans!